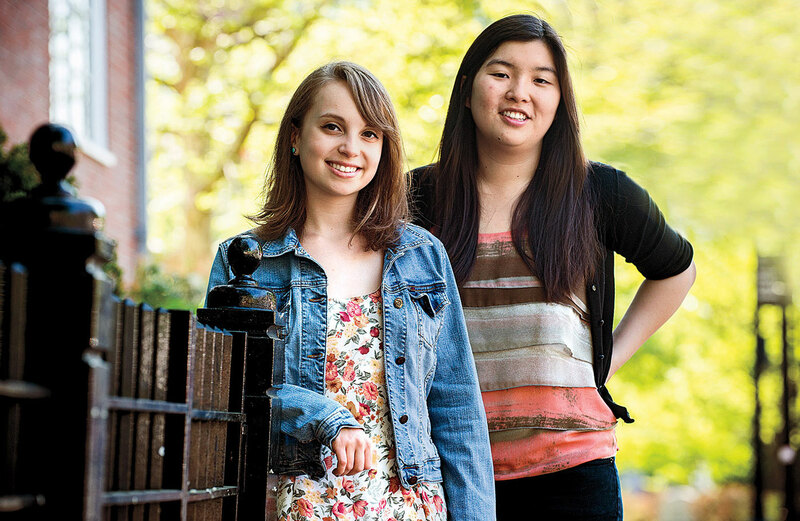 This magazine’s Berta Greenwald Ledecky Undergraduate Fellows for the 2014-2015 academic year—selected from among nearly 30 applicants—will be Olivia Munk ’16 and Melanie Wang ’15. The fellows join the editorial staff and contribute to the magazine during the year, writing the “Undergraduate” column and reporting for both the print publication and harvardmagazine.com, among other responsibilities. Munk, of Bellerose, New York (in Queens), and Leverett House, is concentrating in English and pursuing a secondary field in mind/brain/behavior. She is an associate editor of The Harvard Crimson’s magazine Fifteen Minutes and a member of the features board of The Harvard Advocate, and an active director in the Harvard-Radcliffe Dramatic Club. She spent the summer in Berlin, enrolled in Harvard Summer School classes in film theory and documentary filmmaking. Wang, of Wayland, Massachusetts, and Eliot House, is pursuing a social-studies concentration, focusing on gender and labor in the United States. She has been co-editor of Manifesta, the campus feminist magazine, and on the board of Tuesday, a literary magazine, and performs as a spoken-word poet. During the summer, she worked in Chicago organizing and conducting oral-history research with Walmart employees through Columbia University’s Summer for Respect program. The fellowships are supported by Jonathan J. Ledecky ’79, M.B.A. ’83, and named in honor of his mother. For updates on past Ledecky Fellows and links to their work, see http://harvardmagazine.com/donate/ledecky-fellowships .